Plastic Comb / Spiral Binding uses plastic spirals or combs that can hold up to 400 pages. 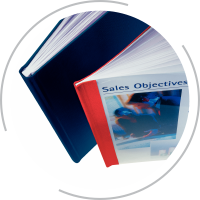 The most popular and economical binding system, it's practical, easy to use and very flexible. Velo Binding is a technique for binding books or documents that uses a narrow plastic strip along the length of the front and back binding edges and plastic pegs attach the strips through holes punched in the pages.Some of the publications that often use this type of construction include: textbooks, research reports, training manuals, user guides, thesis papers, dissertations, and many other types of publications. Velo binding also known strip binding, Velo bound documents do not lie flat on the desk. 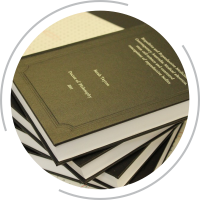 Hard bound or book bind with screen printing Printed or copied documents are either glued or stitched together at the spine by flexible glue, and covered by a hard material on top with screen printing. Colours Available: Black, Blue, Gray and other colours as per the requirement. Wire binding is a popular commercial book binding method, and is known by a number of different names including twin loop wire, wire-o, double loop wire, double-o, ring wire and wirebind. 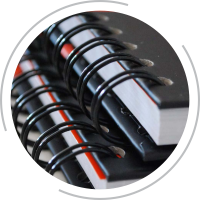 With this binding method, users insert their punched pages onto a "C" shaped spine and then use a wire closer to squeeze the spine until it is round. 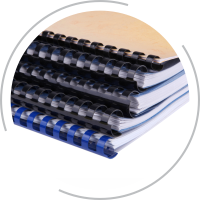 Documents that are bound with wire binding will open completely flat on a desk and allow for 360 degree rotation of bound pages. There 3 types of wire binding they are 3:1 ( 3 holes per inch ) , 2:1 ( 2 holes per inch ) , 19 loop wire. Colours Available: Black, White & Silver.